If you have read my post from yesterday, you will know that I recently got a shipment of two meals from Chef’s Plate. They are a food delivery program that uses fresh and locally sourced ingredients to deliver meals of your own choosing. It’s very convenient for you to have a great tasting and nutritious meal this way! 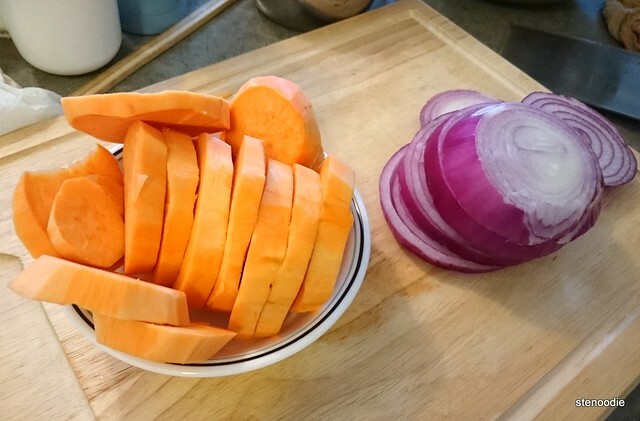 Since it was my second meal prep from Chef’s Plate, I had an idea of what to do. 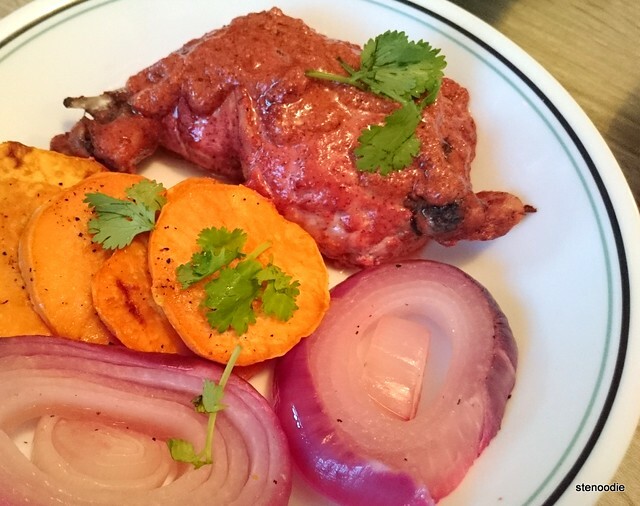 Yesterday’s Morrocan Spiced Lamb Burger was absolutely amazing so I was quite excited about this Tandoori Chicken and Roasted Sweet Potato Rounds plate too! I got all the ingredients ready. This plate also had a difficulty level of medium and would take 40 minutes. 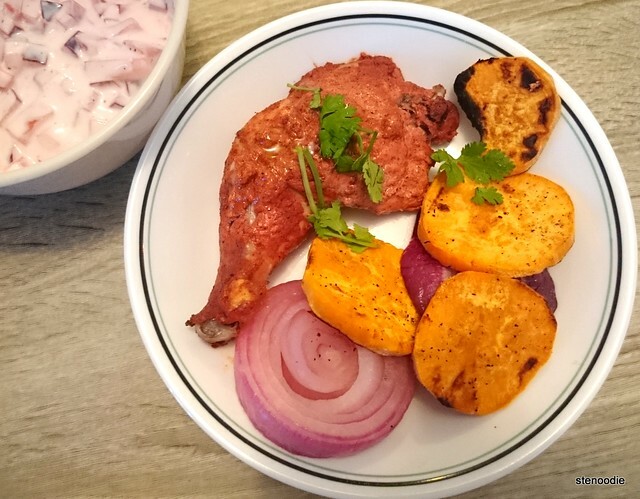 This recipe contained these ingredients: chicken thighs, tandoori paste, red onion, lime, cilantro, red plum, yogurt, sweet potato. 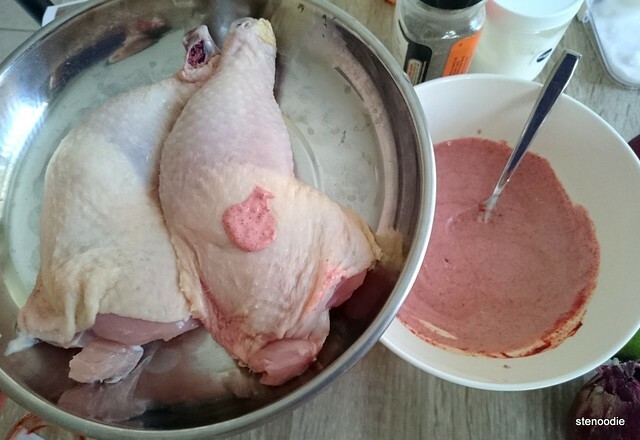 The first part included 10 minutes of marinating the chicken thighs with the tandoori paste and yogurt combination. Then you stick pretty much everything else into the oven and wait for it to be ready. 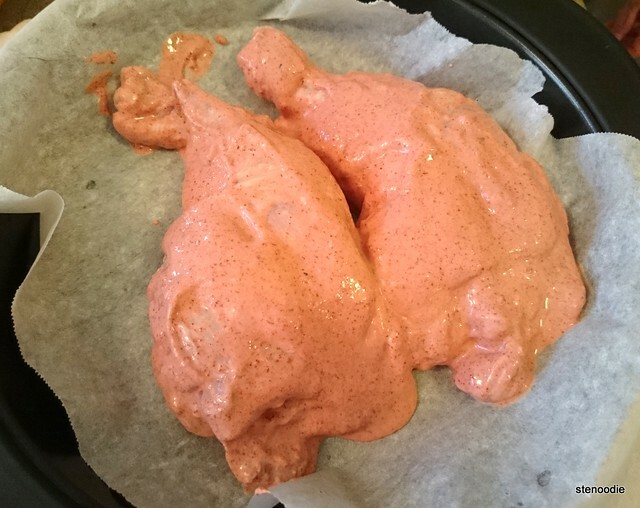 A cooking tip including moving the top oven rack to the highest position before cooking and at the end of the cooking time to replicate how Tandoori chicken has crispy charred bits and to add variety in texture and taste to the chicken. I tried my best but the finished product doesn’t look much like what the photo shows. I was just happy to eat, regardless. I think that the chicken thighs were very fresh and the marinate was pretty good. I think that it could have been a little more stronger in flavour. 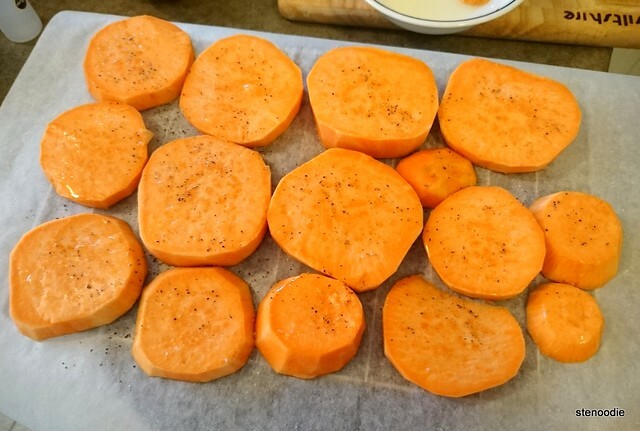 I think the roasted sweet potato rounds were delicious! 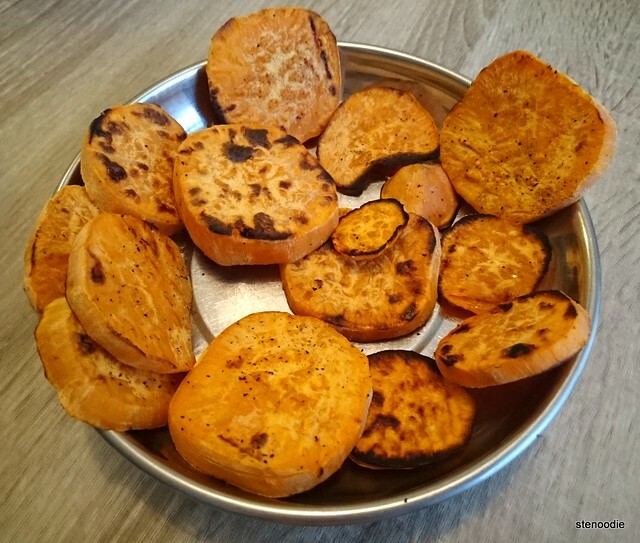 They were roasted just right with them actually being charred on the outside and maintaining its juiciness on the inside. 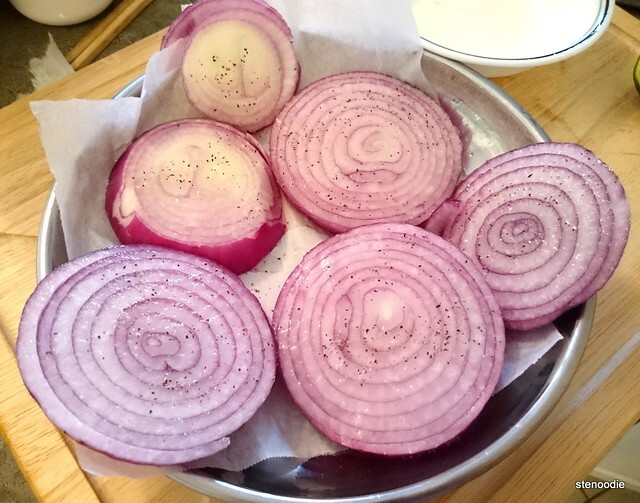 The red onions were good as well. I thought that the red plum yogurt sauce was a little too sour for my taste. 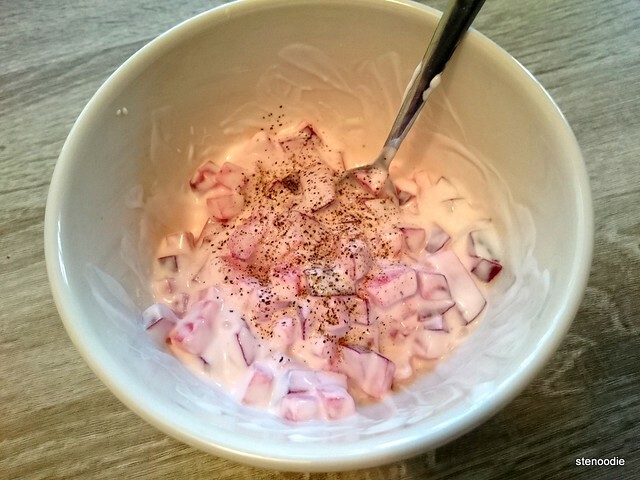 I think it was because the red plum itself was a little sour already (not sweet) so it made the yogurt sauce even more sour. 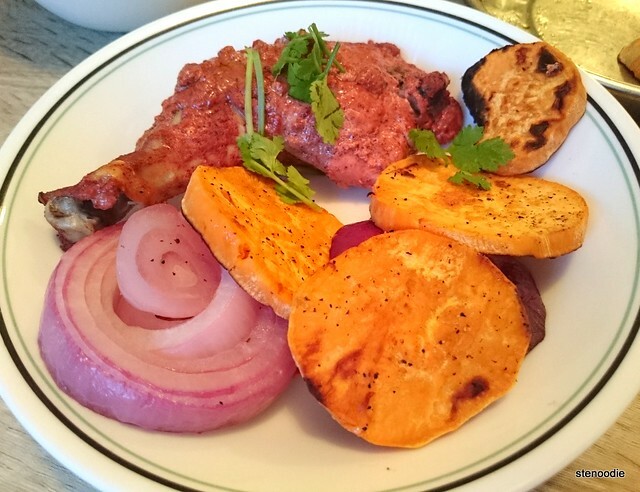 Yummy Tandoori chicken and succulent sweet potatoes! 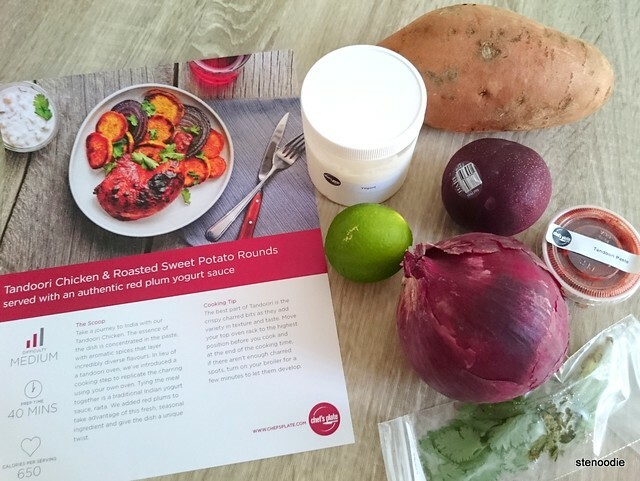 I am looking forward to trying more recipes from Chef’s Plate in the future! 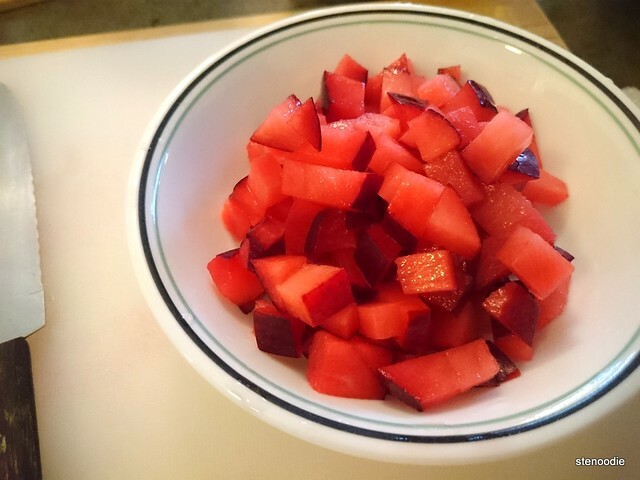 I really enjoy delicious recipes and I have enjoyed both nights of food. 🙂 Thanks again, Chef’s Plate! FTC Disclaimer: Although Chef’s Plate reached out and provided me with a complimentary package to review their services, the opinions expressed here represent my own and not those of the company. This entry was posted in Chef's Plate, Complimentary Adventures, cooking, Food and tagged #2mealsFromstenoodie, #3platesFromstenoodie, @ChefsPlateCA, Chef's Plate, chefs plate 3 free meals, chefs plate 4 free meals, chefs plate 4 free plates, chefs plate coupon Canada, Chefs plate promo code 2019, chicken thighs, complimentary, cooking, DIY, fresh, groceries, home cooking, home delivery, ingredients, locally sourced, marinating, promo code #stenoodie, promo code chefs plate, recipe, red plum, red plum yogurt sauce, referral code for chef's plate, Roasted Sweet Potato Rounds, Tandoori Chicken, Tandoori paste, Toronto, yogurt. Bookmark the permalink.